This creative journey began when founder, Uche Egele, under the watchful eyes of her artistic mother, actively engaged in sewing clothes for her dolls at the age of 3. Fast forward several years down the road, this same drive was the propelling factor that led to the conception of fun, bold and unique pieces for the Marté Egele line of leather accessories. Moving to the U.S, where she obtained a bachelor’s degree in Marketing along with a Professional Designation in Sales, she learned how to better express herself and discovered how to expertly channel her creativity into action. After graduation, she immediately got accepted into the prestigious Fashion Institute of Design and Merchandising (FIDM) Los Angeles to study Womenswear. While there, she gained the necessary skills needed to become a successful designer in the fashion industry. It was in this environment that she learned to better appreciate the unique skill sets that she had gained over time and further complement those skills with the new knowledge attained while learning the trade in an academic (yet practical) setting. After long hours at FIDM LA, and with the support of encouraging friends and family who helped her along the way, she found meaningful employment in top American niche brands such as Elisabeth Weinstock and True Religion Brand Jeans. When the time was right, she returned home to Lagos, Nigeria and worked for a top womenswear brand, GREY where she learned the ins and outs of the Nigerian fashion industry. 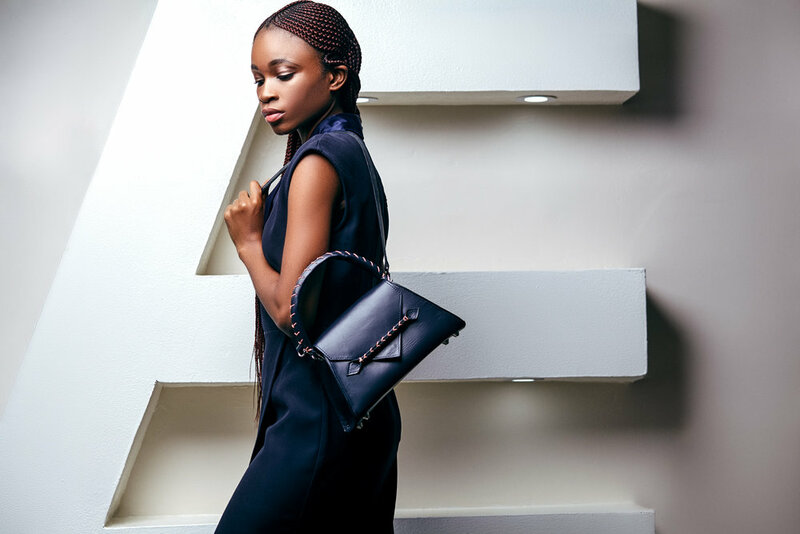 The desire to create and cultivate unique, high quality products are visible in the thoughtful fusion of her native Nigerian style and the western culture where she was professionally trained. She ensures that every leather piece, carefully handcrafted by local artisans, is fun and exciting. The style of playing with geometric shapes along with the infusion of cross-stitch weavings opens up her creativity to so many possibilities, which we’ll discover together as she takes you on a journey.